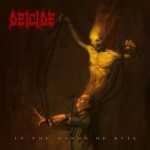 Share the post "Album review: DEICIDE – In The Minds Of Evil"
Century Media – Out Now. When the Hoffman brothers decided to leave Deicide (or were ceremonially fired, depending on which version you choose to believe) back in 2004, many people felt that the days of the American Death Metal band were well and truly numbered. However, the duet Glen Benton (bass/vocals) / Steve Asheim (drums), who were no strangers to overcoming obstacles and, in the process, recording good quality albums, managed to once again soldier on. Take, for instance, the way with which they dealt with the departure of guitar maestro Ralph Santolla: not only did they manage to find in Kevin Quirion a worthy replacement in no time but, with his help, they recorded one of the most impressive albums of the second phase of their career – one entitled “In The Minds Of Evil”. Just like its predecessor, the length of Deicide’s eleventh studio release just barely exceeds the thirty five minute mark. That means that these eleven compositions have a limited amount of time in which to convince you that they are worthy of your attention– something I am quite convinced the vast majority of you will agree with. Why? Simply because “In The Minds Of Evil” finds the band in top form: Benton’s brutal vocals are at their commanding best, guitarists Jack Owen and Kevin Quirion are in constant competition over who will provide the heaviest of riffs or the most flamboyant of solos, while drummer/composing Steve Asheim pounds his skins like there is no tomorrow and in doing so injects the album with both dynamism and aggression. The opening same-title track “In The Minds Of Evil” provides the catchiest of sing-along choruses, while Jack Owen’s groovy riff in “Thou Begone” is reminiscent of those employed during his tenure with Cannibal Corpse. More catchy riffs and melodic guitar solos are on offer in “Godkill”, while the amazing riff-driven “Beyond Salvation” could have easily been featured in the band’s legendary debut release. Keeping a health momentum in “Misery Of One” and “Between The Flesh And The Void”, the album reaches its absolute peak with the duet “Even The Gods Can Bleed” / “Trample The Cross”. Fans of Slayer will find many things to admire about the guitar work featured in “Fallen To Silence” and “Kill The Light Of Christ”, while drummer extraordinaire Steve Asheim has ensured that “End The Wrath Of God” completes the album with a remarkable and highly aggressive tune. Most bands are looking for two things in order to be able to flourish artistically: solid label support and internal stability. Deicide, however, are not such a band. he more obstacles are thrown in their way, the more negativity and lack of support, the more they are motivated to create top quality aggressive Death Metal. In The Minds Of Evil” is a perfect example of what these Tampa/Florida-based Deathsters are capable of achieving when inspired. This is an album every self-respecting fan of Death Metal should wholeheartedly embrace.